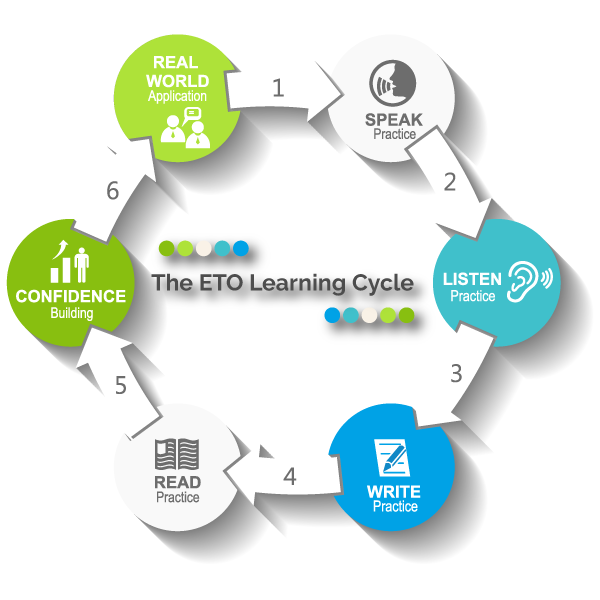 The ETO Learning Cycle helps you KNOW the language instead of memorizing the language. This cycle shows the different stages of learning and how the stages are interconnected. ETO’s integrated approach puts new language deep in your long term memory, making it much easier to learn, remember and use. Our method has been tested and proven by top language curriculum experts. Learn English faster than ever before with our simple 6 step system! Students speak most of the time in class. No boring lectures at ETO. Students pronounce all new language, getting tips on pronunciation, tone, rhythm & word stress. Students really expand their vocabulary by using new language to complete class tasks, activities and discussions. Students practice listening skills in class and during optional homework assignments, with online audio and video files and also in the real world. All classes are taught by native speakers from North America and the UK. Our different teachers, different students and diverse online learning materials expose students to many accents, word choices, sentence structures & speaking styles. Learners get lots of opportunity to use the new language in writing, which puts the language into the long term memory naturally, instead of painfully memorizing them. The online textbooks are accompanied with optional handouts and writing assignments after each class. Also, ETO has a virtual community where students can take quizzes and teacher assignments via our website as well as Facebook and other social media accounts. Students can talk in forums and learn in groups with other students. This is where our virtual community of learners use their new language to communicate in written form. Reading helps learners visually store information in the brain. They learn new language in context via our online textbooks & supplementary material. This strengthens their understanding of new language and they can use it in a wider variety of situations. Extra reading on class topics is given after most lessons via homework. Many ETO learners also read and learn new language from our social media posts, blogs and learning forums. Learning does not stop at the classroom. We stop every 5-7 minutes for checkpoints to review new language, questions & comments. Your weak points in grammar, vocabulary, pronunciation and communication skills are identified and strengthened. ETO teachers create a friendly, supportive & safe learning environment over Skype that helps students feel comfortable trying new language and new skills. Real-world tasks and activities further build learners’ confidence for situations outside of class. Class tasks give learners a chance to recycle old language & practice new language. ETO activities are fun, interactive and all in English. Activities include ranking, voting, solving problems, matching, negotiating, role playing, debating & games that increase your fluency.